Most people who are thoroughly familiar with commonplace refractive disorders of the eye such as nearsightedness and farsightedness have never heard of keratoconus. This potentially serious corneal problem can cause major visual distortion, so it’s good to understand what the condition is and what you can do about it. Here are some frequently asked questions about keratoconus as answered by our optometry team at The Plano Eye Care Center, Dr. Khoja and Dr. Patel. What is keratoconus? Keratoconus is a condition that afflicts the tissues of the cornea. These tissues are weakened to the point that the cornea bulges into a conical shape instead of its normal sphere, creating progressively worsening myopia and astigmatism. What causes keratoconus? It’s believed that when the enzyme balance in corneal tissue is incorrect, the cornea may be extra vulnerable to destructive forces such as UV rays, obsessive eye rubbing and oxidative damage. What are the symptoms? Blurred vision and exaggerated sensitivity to glare are grow steadily worse for up to 20 years before the condition slows its progress. If the bulge causes a crack in the corneal tissue, you may experience brief periods of suddenly worsening vision. How do you diagnose keratoconus? Our experienced optometrists can check the basic contours of the corneas through basic techniques such as slit-lamp testing and refractive testing. If we see evidence of keratoconus, we may utilize keratometry and corneal topography to view the extent of the condition in detail. Does keratoconus require surgery? Very severe or advanced cases of keratoconus may require surgical intervention. Options may include the installation of intracorneal supports, laser reshaping of the corneas or corneal transplants. We can determine whether you might need a referral to an eye surgeon. What non-surgical vision correction options can you provide? The visual distortions caused by mild to moderate keratoconus can often be corrected by eyeglasses. 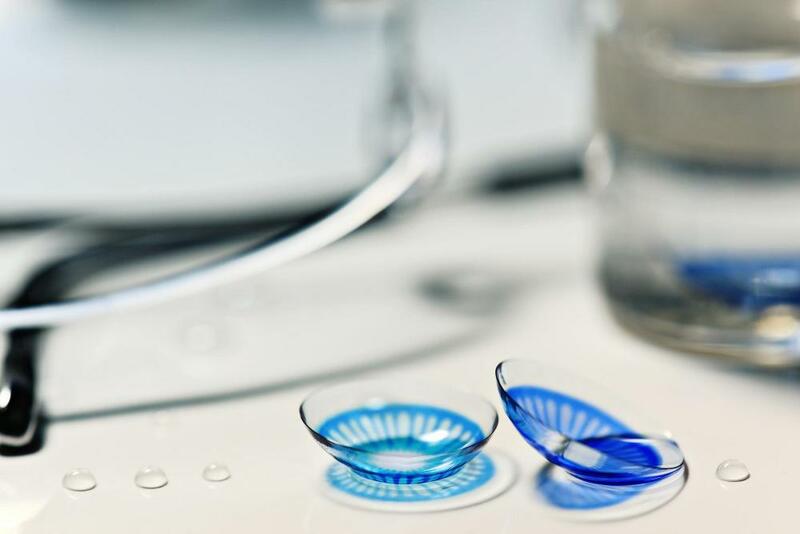 You may also be able to use contact lenses to correct your vision, although standard soft contacts may not do an adequate job unless your keratoconus is extremely mild. What kinds of contact lenses can I wear? Our contact lenses for keratoconus in Plano TX are usually rigid gas permeable contacts, because these lenses hold their shape instead of trying to conform to abnormal corneal contours. We can “piggyback” rigid lenses on top of cushiony soft lenses for greater comfort, or we can fit you with hybrid lenses that have soft rims. If your keratoconus is more severe, we can prescribe scleral contacts that sit on the white of the eye. Need Contact Lenses for Keratoconus in Plano TX? Keratoconus can be an understandably distressing condition, but our team at The Plano Eye Care Center can provide the necessary recommendations and treatments to help you keep getting the most out of your eyesight. Call 972-964-3937 today to schedule an eye exam. We’re happy to answer any further questions you may have about keratoconus!